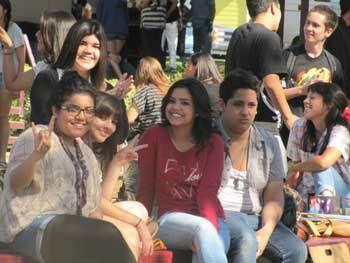 I spent the day at Covina High School today. As I write this I’ve got a huge smile plastered across my face. I was invited to play my Kora and do a little singing for the school’s “Multicultural Festival.” It seems each day the students celebrate different cultures from around the world. Today, my day, they were focusing on the continent of Africa. The students from the ASB set the tone with me. They were all accommodating beyond belief and made me feel right at home. They even helped me get set up by hanging my banner and asking if there was anything else I needed. I have “never” got that kind of treatment at high school before… never. As I walked around getting the lay of the land before performing I was greeted with smiles and warm greetings. Did I say that this is a high school? It wasn’t what I had anticipated. There was maturity about the kids I was encountering that put me right at ease. When I came time for me to perform, it was during the student’s lunch time. I wasn’t expecting to get a large crowd gathered around me, and I didn’t. Most stood off in the distance enjoying their meals, talking with friends and horsing around. It reminded me of my days in high school. I was feeling a bit nostalgic as I glanced up from my Kora to the sights and sounds surrounding me from the outdoor stage. I had an hour to play for them and so I went though the songs on my new CD, playing each of them in extended form, live. It was fun! I was really enjoying this and they seemed to as well. Usually I combine the music with storytelling and colorful commentary, but not today. Today I went into a musical zone and just poured my heart out through the strings of my harp. It was amazing, therapeutic even. When I finished with the final song the entire campus erupted in loud applause. I wasn’t expecting it and so it surprised me. I wasn’t sure how many had actually been listening. As I looked up I could see hundreds of kids, all over the campus, and staff too, all applauding. I beamed a bright, uncontrollable smile and felt affirmed on a grand scale.